Our Deep Love marriage and relationships sermon series begins on Sunday! No one is interested in a shallow relationship, right? We don't want to hover around the surface. We want to sink the roots of our relationships deep into love. We want to enjoy deeper connection and understanding. Deeper conversations and bonding. Deeper intimacy and passion. And that's exactly what Deep Love can do for relationships! On Sunday, we will explore the role "Personality" plays in the key relationships in our lives as we consider Jesus' teaching from Luke 10:38-42. If you are travelling or staying at home with flu, you can join us online at 9:45 am. This service will be streaming live via our Eureka United Methodist Church Facebook page and Facebook Live. If you are interested in this amazing assessment that has been made available to us, please contact our Deep Love assessment coordinators by sending an e mail to lifegroups@eurekaumc.org to request information about completing the assessment. Have you been attending our worship services for a few weeks or a few months? Do you want to learn more about connecting at Eureka UMC? Please join us for "Hot Cocoa With the Pastor" for an informal conversation about the church, our mission, our vision, and your next step for connection. 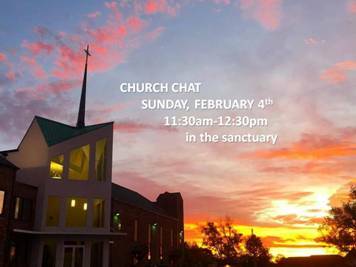 You are invited to join Pastor Tim on Sunday, February 4th for "Church Chat". This time will be devoted to updating everyone on our HCI prescriptions, reviewing all of the great things that happened in 2017, looking ahead into 2018, reviewing our "vital signs"; attendance, budget, etc. After the updates, there will be a time set aside for any questions you may have about Eureka UMC. We have continued to make wonderful progress towards the prescriptions we accepted as part of the recent HCI! We are forming two new teams to address our next two prescriptions. If you'd like to be considered to be part of one of these teams, please complete the online application on our website or mobile app. There are also paper application forms located at the Welcome Desk. Applications need to be submitted by January 21st. The team members will be selected by our HCI Coach, Rev Jon Spalding, and Pastor Tim. Congregational Care: The Pastor, in consultation with the Coach, will name a Care Team no later than January 31, 2018. This team will develop a lay-led congregational care system to create a culture of love and support. Congregational Identity and Unifying Vision: The Pastor and Leadership Team, in consultation with the Coach, will develop a Vision Team by January 31, 2018. This team will be comprised of a cross section of the congregation including members from both worship services. This team will work with the Coach and Roger Ross (Director of Congregational Excellence, Missouri Conference) to develop a visioning process and strategy by June 30, 2018. January 28th at the Timbers from 4-6 pm. Proceeds this year will go to Flood Relief. You may sign up at the connections table or CLICK HERE to sign up online. We will be taking a group of youth to Concord Trinity UMC on Friday evening and Saturday. We will join other students from the Gateway Central and Gateway Regional districts for a weekend of fellowship, discipleship, and service. The event will feature illusionist Brett Myers, Passion Painter Andy Raines, special guest speakers and worship leaders, food trucks, mission time, and more! 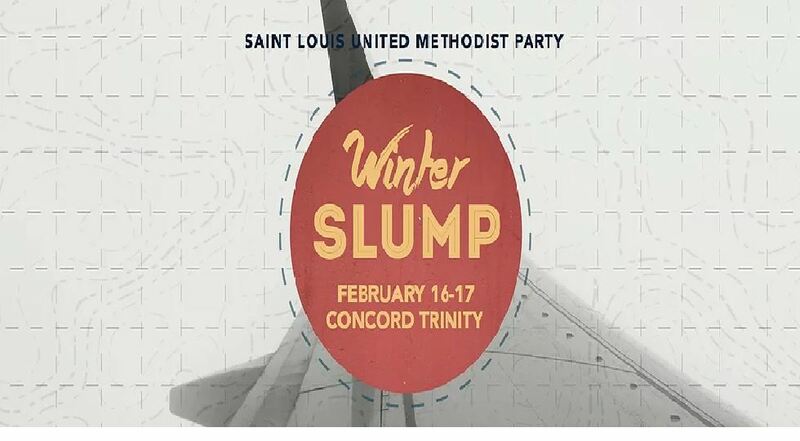 For information on schedule, visit https://www.winterslump.com/schedule. Transportation will take place from Eureka UMC. Register on our website, eurekaumc.org, or for more information contact jenny.babb@eurekaumc.org. CLICK HERE to register today! EUMC FAMILY NIGHT AT THE POLAR PLUNGE February 20, 5-8PM! The St. Louis Crisis Nursery is collecting gently used purses for moms who have used the support services of their organization. These moms often use coat pockets and/r plastic grocery bags to carry personal items. If you have a gently used purse(s) you are ready to part with, please place them in the big brown labeled collection box in the “Commons Area” by Sunday, February 4th. Thank you for spreading the love of Jesus Christ. 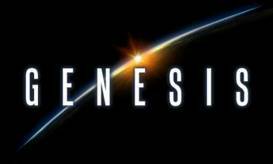 Genesis eets at 7pm on the first and third Sunday of each month. Genesis is open to all high school youth and young adults who are interested in deepening their relationship with Christ. Please contact Cathy Westbury at westburtycathy@gmail.com for more information!